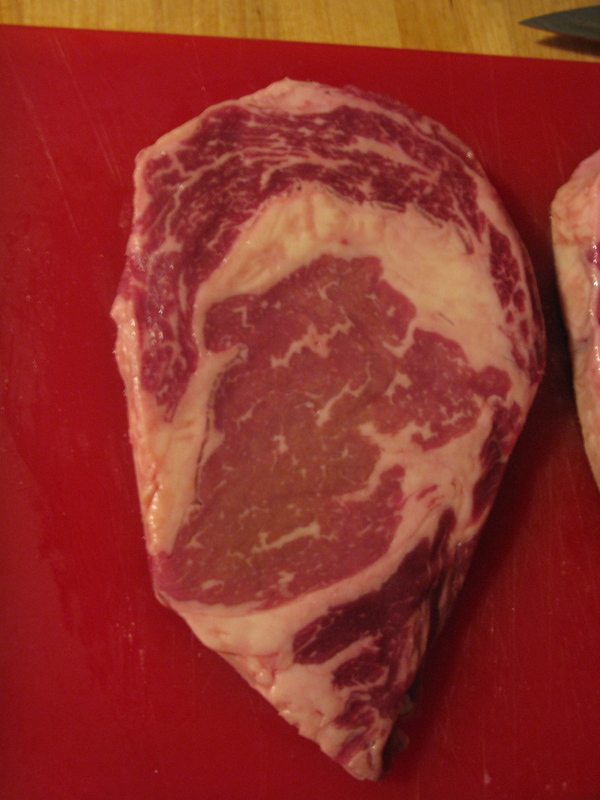 J – Like all good, red-blooded Americans (and most other humans) I love steak. A good steak is a thing to be marveled at. Growing up in the South, I’ve always been told that the way to cook a steak is on the grill, and to cook it rare or medium-rare (relevant King of the Hill scene) – anything else is a waste of good meat. However, our good friends gave us an Alton Brown cookbook for Christmas, and in it we found a method for making steak that piqued our interest. When we got a couple of really excellent pieces of meat from Friends & Farms a little while back, we decided to give it a shot. So the basic method needs only the following: a large oven-safe skillet (we used our cast-iron skillet and it was perfect), a kitchen timer, a colander + a pot lid big enough to cover it, your stovetop, and an oven pre-heated to 500 F. Oh, and two steaks – 1-1/2″ thick ribeyes are best, about 15-16oz each. For the sauce, if you choose to make it, you’ll need either cognac or bourbon (your choice; I used some bourbon and it was delicious), a crumbly cheese (I used goat cheese but blue cheese would work very, very well too), and two tablespoons unsalted butter. Put the skillet in the oven as it heats. Once the oven reaches 500 F, leave the skillet in there for about 5 minutes, then move the skillet (carefully) to the stovetop on high heat. 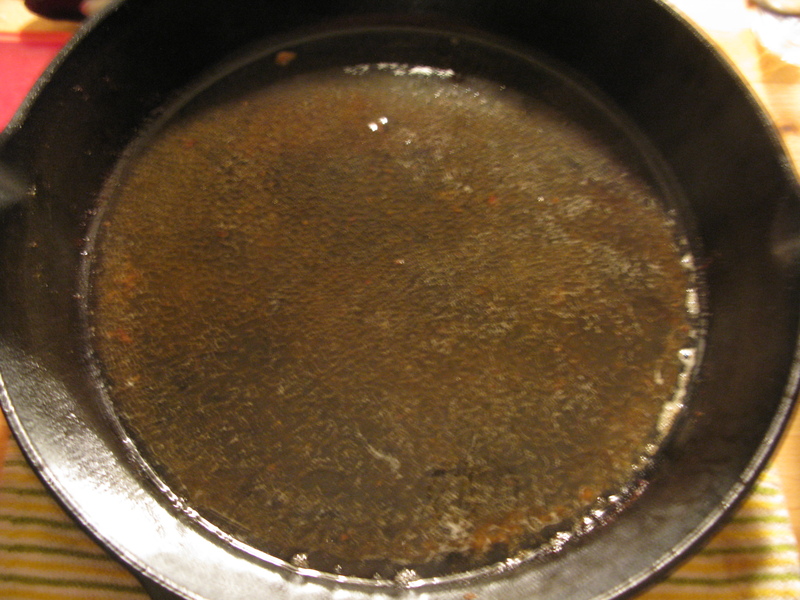 Leave it on the stovetop on high for another 5 minutes, then (carefully) place your seasoned (salt + pepper + some oil on all sides) steaks on the hot pan. Cook for 30 seconds (time it with the kitchen timer), flip with tongs and sear for another 30 seconds on the other side. When the timer goes off the second time, place the skillet in the 500 F oven for 2 minutes. Flip the steaks one more time and leave in the oven for the final two minutes. Immediately remove the pan from the oven and place on a heat-safe surface (I pulled one of the guards off the stovetop and put it on there). Remove the steaks to the colander and place them at an angle such that the steaks don’t lie on top of each other, and the juices drip down into a bowl below. 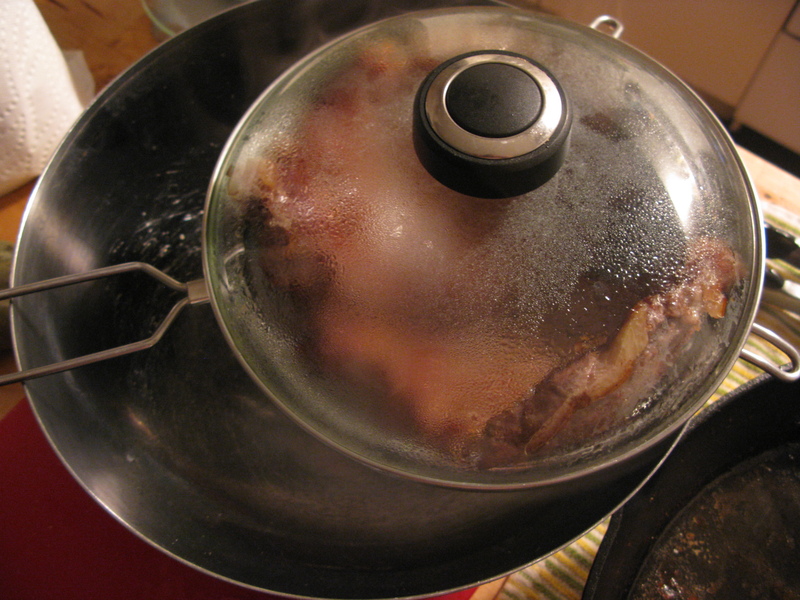 Cover the colander with the pot lid and collect the drippings while you make the sauce. Add 1/4 cup cognac or bourbon to the still-very-hot skillet and deglaze all of the delicious bits stuck to the bottom with a whisk (just whisk it). Let the residual heat of the pan reduce the cognac for ~30 seconds, then add 1 oz of cheese and whisk. 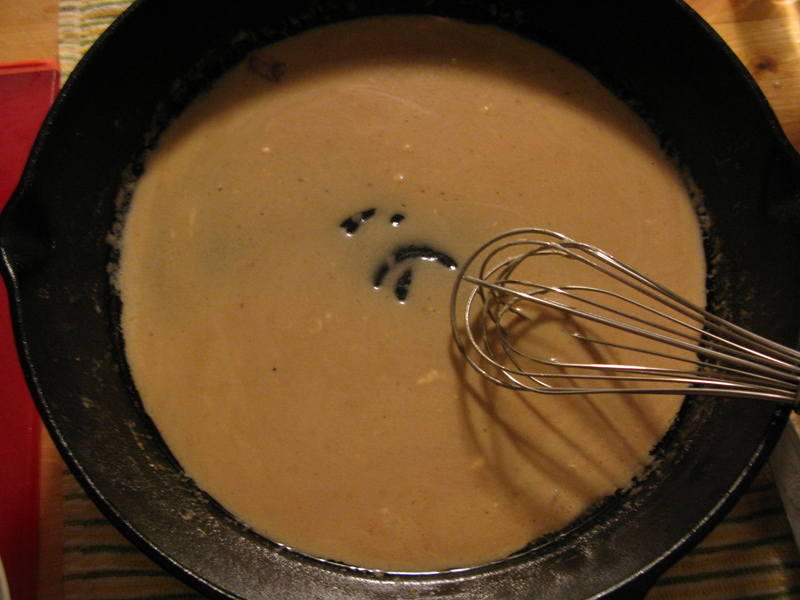 When the cheese is good and dissolved, add the butter one piece at a time and whisk in until it, too, is dissolved. Return the drippings you collected from the steak and whisk those in, or just soak them up with a few pieces of toast for a delicious snack. Pour the sauce into bowls or ramekins, or just pour on top of the steak (careful – the pan is still molten lava). 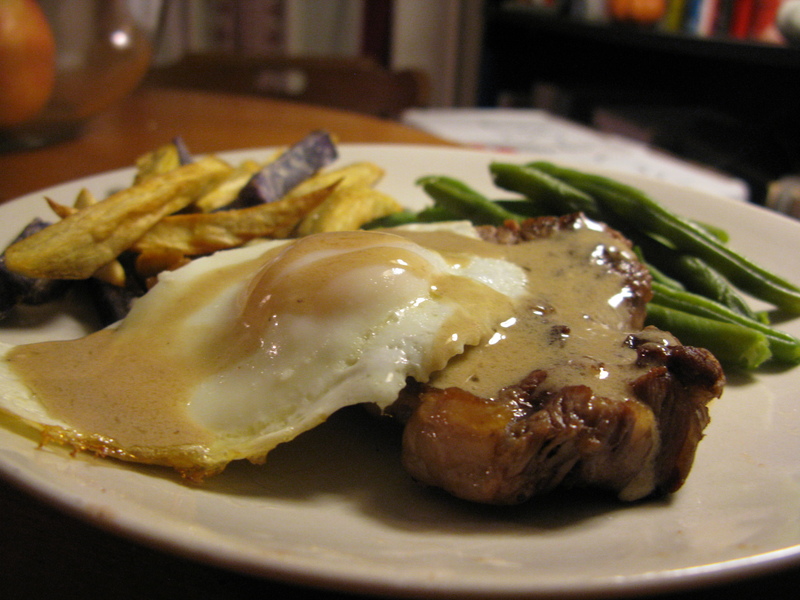 We also fried a couple of eggs and topped the steak with those – you’re going to eat steak covered in bourbon/cheese/butter sauce, you might as well throw an egg in the mix, too. Serve with pan-fried asparagus and home-made fries to soak up all the juices left on your plate. Enjoy! *Note – the recipe here will get you a medium-rare steak. Leave it in the oven for less time if you want it rare (and I bet you do). If you want it medium or, god forbid, medium well, then you just get out. If you’re thinking well done, just go season some charcoal and call it a day, you barbarian. Just kidding – just cook it longer, Conan.